Lately, I wanted to get better at DevOps, and especially with container-based NodeJS development. When I heard about the new tool fuge to help quickly develop microservices using containers, I have decided to give it a try. If running Docker is still too much trouble, take a look at my tool quickly. My first goal is to write a small service to compute sum of two numbers. Fuge can build and run both services and websites, and I will start with a service. I had to wait while the NPM install finishes (make sure to set npm set progress=false before running NPM install due to the progress bar bug). The fuge command created a new folder with Dockerfile, README, package, etc. - all the scaffolding necessary to start the service. The main file has the stub code for the service itself, based on Seneca micro services toolkit. I will replace the stub code with simple add and sub operations. The package.json created by fuge already has a few utility commands, and even some simple unit tests. Unfortunately, it relies on global jshint command, so I had to install it locally to be able to run the lint and test steps. When running the unit tests one can see that it actually creates a service bound to the socket, etc - exercising the full micro service round trip. This seems very verbose, so in the future I plan to apply partial application to the seneca.act method, and to convert the Node-style callback to promise-returning method. For example, using object binding with obind I could create a function to just execute add method with just the operands. "run": "SERVICE_HOST=localhost SERVICE_PORT=3001 node service.js"
Hmm, we are getting back the concatenated string, not added numbers. Let us ensure that our service adds numbers. 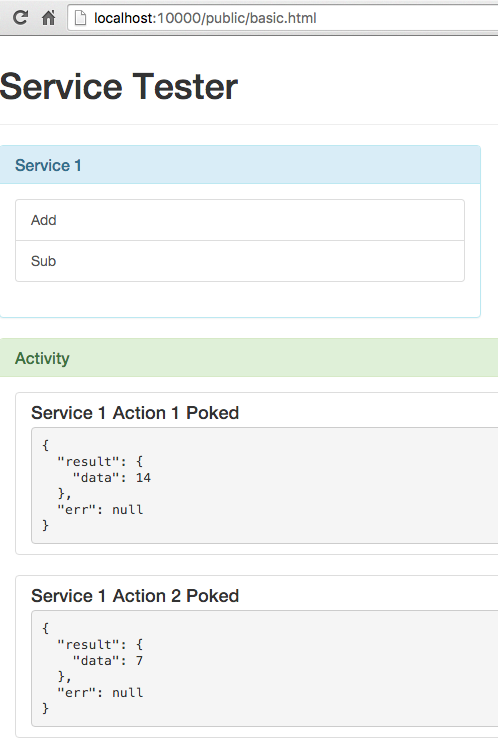 In order to run the service inside a Docker container, fuge needs to create a system. Let us create a system - it will include a server, and two services, just like our addition service above. Notice that most parameters are passed from the environment variables already, and thus the server to micro service bridge is easy to run from a container. After modifying the HTML of the page, we can call the right route, which calls the right micro service addition and prints the result JSON back in the page. We can easily develop our system, without running multiple terminals, and with quick service reload (via fuge shell). Now let us switch to using Docker (via docker-compose) and run the same multi-container setup. I will show how to run the system in a hosted environment in the next blog post.